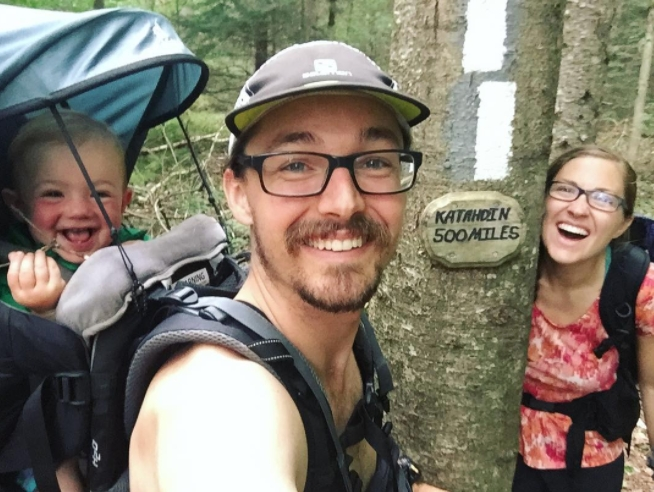 In case you missed it, the Quirin trio completed their AT thru-hike on September 30th—195 days after their start date of March 20th. 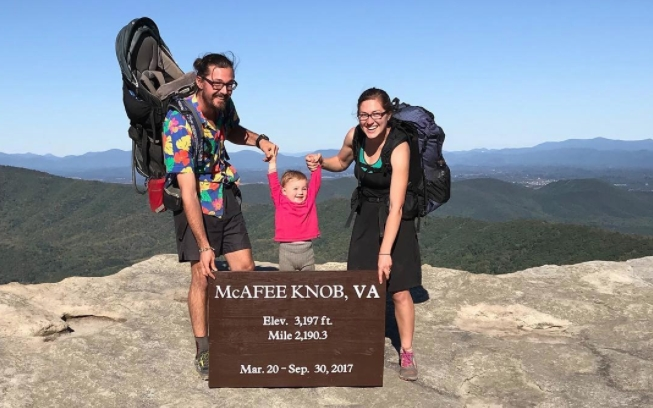 This means Bekah and Derrick successfully hiked 2,190 miles with baby Ellie, and as far as we know, they’re the first people to complete a thru-hike with a baby. Their background in backcountry guiding, prior trail experience, and keeping a constant level head made this experience “easier than expected.” In short, they crushed it. Here are Bekah’s post-hike thoughts, and a few words of advice for anyone looking to take on something similar. What was your plan of attack been for getting through the trail? What led to these choices? We started in Catawba, Virginia and hiked south to Springer. This allowed us to be close to family during the first few weeks of cold weather. If a bad weather pattern came in, we could have them pick us up. And we were thankful we did this! Right as we were entering Grayson Highland State Park, a wintery storm rolled through with 70MPH winds, hail, snow, and a low of 17 degrees. When we saw this storm forming, we had family pick us up until the storm passed. The first week of June we drove to Katahdin and continued south. We finished in Catawba where we started, and of course feasted at The Homeplace. We followed the mildest weather on the trail! 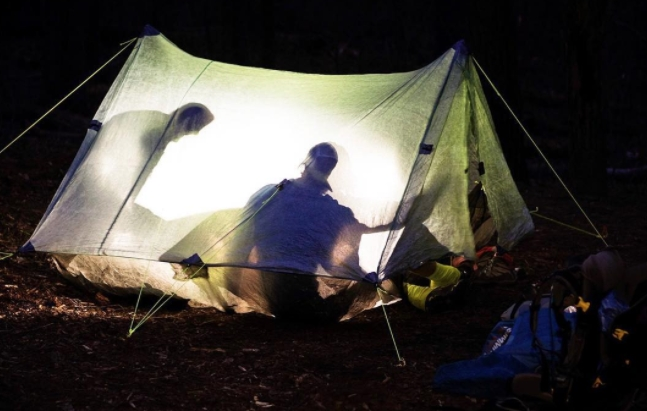 Did you stay in your tent, shelters, or a mix? We only stay in our tent, preferably away from shelters if possible. This way Ellie could play and talk jibberish without bothering anyone. The few times we did camp near others, they were most often happy to see Ellie and play with her. How many miles per day did you average? We averaged 15 miles per day except through Maine and New Hampshire, which was 10 miles per day. What was the most surprising part of the journey? Was your thru hike easier, more challenging, or about the same as you thought it would be? We think it’s been easier as far as Ellie goes. We physically prepared for the worst. We got re-certified as Wilderness First Responders before we left, but thankfully never had to use any of those skills on any of us. We planned for a full eight months to be on trail, and mentally prepared for the possibility of skipping sections for her safety. We never entered a single section where we felt like it was unsafe to have Ellie with us. Even in areas like Maine and the Whites, we watched weather patterns very carefully and didn’t hike when there was a good chance of poor weather. Our experience prior to the trail really helped our confidence on our thru-hike, and I don’t think we would have thru-hiked with a baby without extensive backcountry experience. The rest of the aspects of the trail turned out as expected. Do you feel like you were all adequately prepared? Yes. Recerting as WFR prior to our thru hike prepared us for medical emergencies in the backcountry. Our career and educational background is in the outdoor field guiding multi-day backcountry trips for at-risk youth, including backpacking, so this trip felt like second nature to us—even with Ellie! The most difficult section of trail, either logistically or terrain wise? Maine and New Hampshire were much more difficult due to the terrain, which had nothing to do with having a baby with us! However in these sections, we were extremely careful to pay close attention to our footing and to weather patterns. 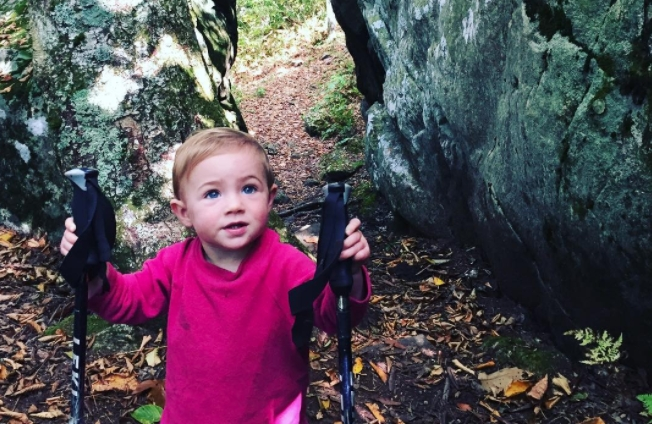 Derrick carried Ellie through Maine and New Hampshire, and he has countless hours of rock climbing experience. While that doesn’t have much to do with backpacking, he has mentioned many times that this experience helped him navigate good footing through the rocky terrain. How did Ellie do in the great outdoors? Did she enjoy the hiking? She started walking in June (on the AT of course!) and she loved walking down the trail, exploring through nature, finding the white blazes, and riding around in her backpack. She really enjoyed it all… as long as we frequently switch things up for her. We’ve already been out to hike three times since we finished our thru-hike less than a month ago! 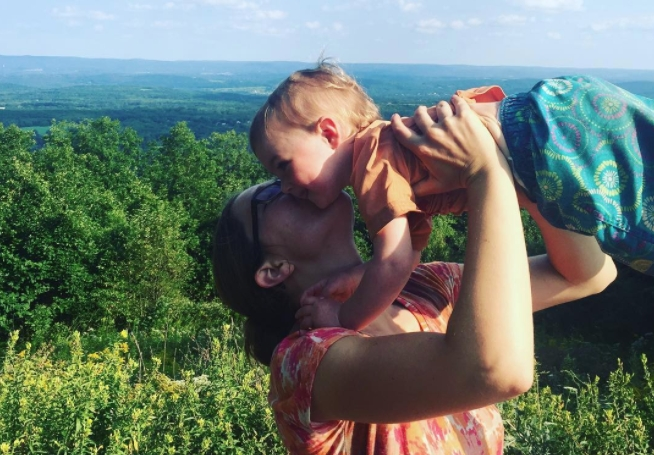 Was hiking with a baby as big a deal as people thought it would be, or were you guys completely adaptable? I attribute a lot of our success to having prior experience before the AT. It would have been stressful trying to learn how to filter water, set up a tent, and dig a cat hole while also managing a wiggly one-year-old in the wilderness. However, since these skills were already part of a regular routine for us, we could really focus on Ellie and her needs. It also helps that all three of us have very relaxed and flexible personalities. How did you and Derrick do together? We have spent a lot of time in the backcountry together! I mean a whole lot. So we knew what to expect from the other before we left. We both grew a lot in our roles as husband and wife. I even let Derrick shuttle into town to buy a groceries for full resupply on his own, which was a big deal (Derrick doesn’t buy groceries too often!). While we were together 24/7, we both found ourselves lonely occasionally, desiring trail friends to hang out with. 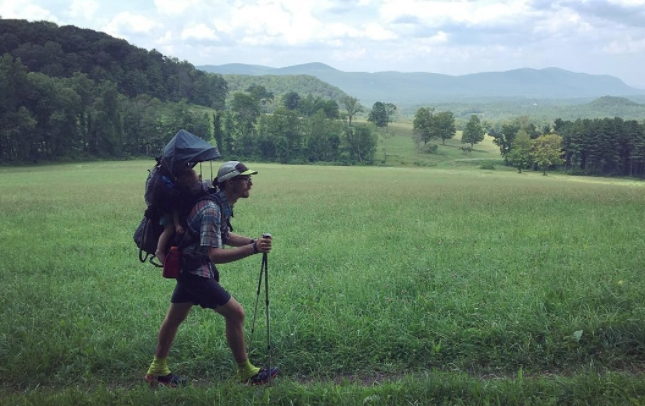 We found that when you already have a hiking partner, let alone a baby on your back, other thru-hikers often assumed we didn’t need the company. So the trail friends that did stick around for more than a few minutes meant the world to us!! It seems like you have an overwhelmingly positive response to your journey. Have you found this to be true? This has been SO true! We emotionally prepared to have a lot of negativity thrown our way, and it was quite the opposite. We had floods of encouraging e-mails, snail mail, and in-person interactions. Almost every single day we heard something that encouraged us in our journey- even the Instagram comments impacted us and brightened our day! What were the biggest differences—in your planning and hiking—with having Ellie there? We had to give ourselves a lot of flexibility. For example, Ellie did great sitting in the backpack while she was taking a nap and for a little while after she woke up, but once she started walking she really wanted to be independent and get out and explore on her own. So we never just let her cry and be miserable in the pack. We would stop and let her take hour-long play breaks throughout the day. We even let her walk on her own some to stretch out! A whopping 0.2 miles an hour! While many thru hikers would hike most of the morning and afternoon and be to camp by 5 pm, we spread our hike throughout the day and started early right after the sunrise and wouldn’t arrive to camp until about 30 minutes before sunset. Any words of wisdom for our readers? If you’re thinking about distance hiking with a little one, make sure you have experience before taking on such a long endeavor. 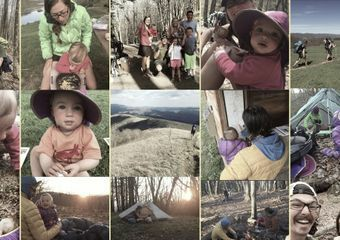 We want everyone who goes backpacking with a baby to have a positive experience like we did, and while it’s most certainly not all smiles and giggles, experience will allow for more smiles and giggles from everybody! Thank you so much for all of the encouragement along the way! We are thankful that the AT community has been more than supportive. All photos courtesy Bekah and Derrick Quirin. The rest of the images from their hike can be found on the family’s Instagram, and they also have a website with more hike updates here. online which you can buy handily. A local high school graduation, the Peninsula High School, submitted the name Seahawks.